What is Availability Check and How to Configure it? When we create a sales order, there are several basic functions which are executed automatically for the dynamic order management . among these basic functions, availability check and transfer of requirements are crucial. First, the system carries out backward scheduling and establishes the material availability date = desired delivery date-transit time-loading time-picking & packing time and on this date an availability check is carried out using ATP logic which means available to promise quantity =total warehouse stock+incoing orders-outgoing along with the availability check the requirements also are transferred to MRP. 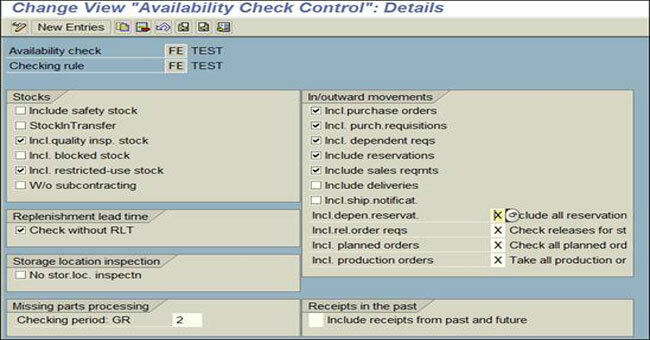 Availability Check is an integral part of business process it determines the if the desire deliverable quantity can be met on requested delivery date or not.Then it passes to Material Requirement Planning. Or we can also say. 3) data manipulation and updates. How to configure the ATP. As per the topic there is no clue of configuration. Sir .. is it possible to check which material is tied to which plant ?